Last week we followed the British as they landed in Mesopotamia and advanced to Basra. This landing would be just the beginning of the campaign of 1915 and early 1916. This episode we will continue to follow that campaign as the British, under the leadership of General Townshend advanced first to the small town of al-Kut and then towards Baghdad. The Mesopotamian adventure would find the end of the road at al-Kut, where the British would experience what would be called the greatest military humiliation in the history of the Empire. But before we talk about more fighting in Mesopotamia, lets take a brief look at some of the struggles that the armies in the theater faced as they tried to support these huge armies in the desert environments of the fertile crescent. The Middle East is a new theater for us, and it is a unique environment where trying to supply armies was different than really anywhere else. The challenges were so, well, challenging, and unique that in The First World War in the Middle East the author spends an entire chapter just talking about all of the problems. Much of the information in this section of this episode comes from the book. Here is a quote from Ulrichsen "Civilian and military planners additionally faced a steep learning curve as they struggled to adapt the new and often unfamiliar requirements of large scale warfare to the specific settings of the Middle Eastern campaigns." Many of the problems present has been discussed at various times in other theaters but never had they all had an effect at the same time. There were large distances involved, just like in the East, but here it was stacked on top of unforgiving weather and areas where existing transportation options were usually only around rivers. This wasn't the end of the problems though, there was also the fact that the local infrastructure just was not designed to handle the demands of large groups of men that were the size of the armies in 1914. Tens of thousands of men take a lot to keep supplied. As a result of all of these problems after the British landed and started to advance they were still highly dependent on India as their primary source of supply. Even after they built up bases in Basra they had to transport everything either up the river or use traditional camel caravans. To make the whole situation worse Basra was completely incapable of handling the load being placed on its port facilities. After the city was captured by the British it could process 2 transports every 3 weeks, more than enough for peace time activity, but the British would have 2 whole divisions supplied through the port by the summer of 1915 and 2 transports a month was barely able to keep them going. This situation would continue for far too long. You may be wondering why they didn't make any move to improve the port at Basra to handle more supplies, and that would be completely logical, but it just was not in the budget. The projects to increase capacity were no small undertaking and the government in India, which found itself mostly responsible for financing the campaign imposed a strict budget on its commanders and the improvement to the port facilities just didn't fit within that budget, to the great detriment of the campaign. Once the supplies were ashore the struggle was not over. Rivers had been used for millenia to transport goods huge distances, and I am sure the British planners saw the Tigris and Euphrates on the map and assumed that they would be good to go. This was a huge mistake, and the misunderstanding on some the particulars of using these two river would wnsure that they were not used properly. Maybe the biggest mistake they made was the failure to realize the huge differences in the rivers due to the change of seasons. The Euphrates, for example, was often very shallow in the dry season and required a very shallow draft boat to navigate. The rivers would also flood at certain times of the year when it rained and this would cause an equal but opposite problem where the avenues for advance along the river were swamped and began seas of mud. All of these problems could have been accounted for, if the British would have properly accounted for local circumstances. It did not help anything that the Middle East was considered a side show which meant that even if they could have greatly increased the capacity of the port at Basra and perfected the transport of those goods upriver, they still might not have had enough. The troops were often not given enough resources from Egypt and India, forcing them to try and rely on local sources to make up for the shortfall. This then taxed the local infrastructure and resources beyond the breaking point. During the war Syria, Lebanon, and Palestine would all suffer famines that would cause great suffering in the civilian population. It should be noted that, while the war certainly played a part in these famines, it was not totally the fault of the British, apparently there were some problematic weather patterns and, I kid you not, a plague of locusts. All of the problems discussed so far have been strategic and logistical problems, and I haven't even touched on the problems at a tactical and personal level. Fighting in the desert, with the sand, the heat, the cold, was all difficult for the troops who were unused to the conditions. Apparently, and there seem to be a few different sources of this like I mentioned a few episodes ago, mirages were a big problem for the British troops who were seeing them for the first time. Under all of these circumstances it is unsurprising that the British would make some hefty mistakes, so I guess it is time to start discussing them. We left off last episode with the British having landed troops and taken over the cities of Basra and Qurna on the Shatt el-Arab. Soon after these two cities were taken their collective eyes started to slowly move northward as they searched for another target further up the Tigris and Euphrates rivers. Any further advance would require more troops, more resources, and so more troops were brought in from India to allow the advance to continue. The supply routes would remain the rivers which were precarious at best, for the reasons that we have already discussed in this episode. However, most of what we discussed above was around the shallowness of the rivers, the floods in the Spring of 1915 were just as problematic, or maybe even made the situation worse. Here is Major Hubert Young discussing the situation "It is difficult for anyone who has not seen the effect of rain upon the flat alluvial desert of the Basra delta to form any idea of the resulting abomination. A particularly glutinous kind of mud is evolved in which it is almost impossible to stand upright, and in which cars and carts stick fast, and horses and camels slide in every direction." Getting boats was also a problem not because, at this stage, the leaders did not know what kind to order, but instead the fact that they had to be ordered and shipped all the way from England, instead of coming from India. This was due to the fact that the industrial capacity of India had been intentionally reduced in the years before the war out of fear of rebellions. 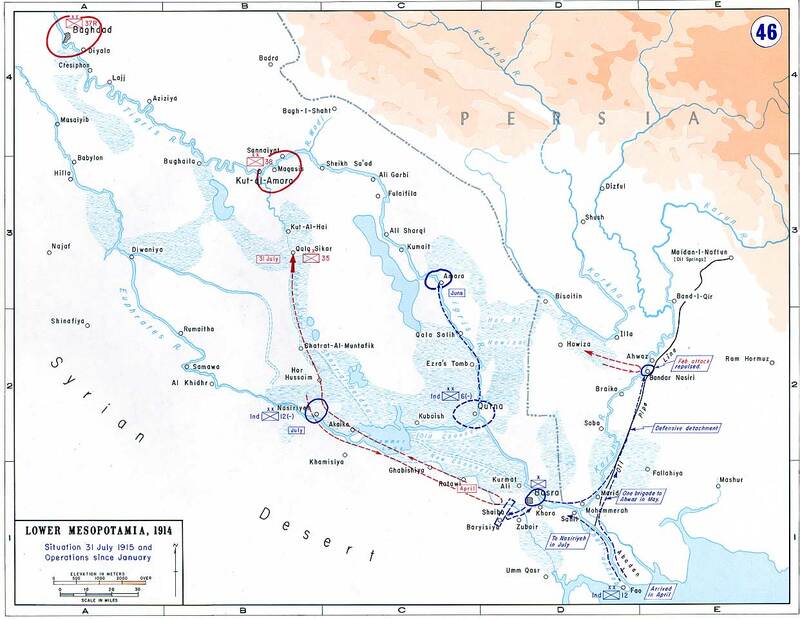 Even with the weather and supply problems two more jumps were made in the summer of 1915 with the capture of the cities of Amara on the Tigris and Nasariya on the Euphrates. Both of these represented a roughtly 75 mile jump on the rivers, taking the British front further into modern day Iraq. These advances also meant that the British forces were strung out over the roughly 200 miles between the Persian gulf and the two newly acquired cities. Now, with these two cities captured the cycle began again and the British again looked further up the rivers to find their next possible objective. This time their eyes settled on one objective instead of two, and that objective was the town of Kut. Kut was a small mud village that was in a loop of the Tigris river so that it was surrounded on three sides by water. Importantly it was located at the point where the Shatt el Hai met the Tigris river, the Shatt el Hai is a canal that connects the Tigris and Euphrates and it was an important location for the British to occupy. The Viceroy of the Secretary of State for India would even go so far as to say that the capture of Kut was a 'strategic necessity' since it was in a position to command the entirety of the lower Tigris and Euphrates rivers. It would do this by greatly hampering the Ottoman's ability to move troops between the two rivers, a vital activity for the Ottomans given their sparse manpower at this point in the region. Everytime the British had advanced it had become more and more difficult, and the advance on Kut was no exception. The problems generally were not, at this stage, from Ottoman opposition but instead from the elements. The advancing troops were starting to have problems related to staying healthy. The health concerns were not that much different than those experienced by the Troops at Gallipoli in the summer of 1915, the typical tropical and sub-tropical diseases coupled with deficiency based ailments like scurvy. Scurvy was actually a really big problem for the men because there was never much fresh fruit and produce available locally and it was difficult to move it up the river. These ailments would put more and more men out of action completely as the campaign continued. To put these problems in perspective, during the 1915 Middle Eastern campaign the London War Office set the casualties from actions with the enemy in the range of 23,000. Not a very large number on the scale we have been discussing. The number of casualties due to disease though, they were over 200,000, nearly tenfold more. When the troops of the 6th Division moved towards Kut in late summer 1915 they were almost completely reliant on the river, and during this time of year the Tigris was at its lowest level of the entire year which just made it more difficult for the boats to keep moving. The difficulties greatly slowed the British advance and made it easy for the Ottomans to being to prepare for their coming. These preparation wouldn't great affect the capture of Kut, which was taken in late September without too much of a fight. The conditions left the British troops somewhat isolated though in their newly captured town. With their forces becoming more and more spread out the British upped their communication with the local tribes to increase communication and hopefully negotiate favorable treaties with them. Ulrichsen gives three primary drivers for tribal decisions during these discussions. The first was how they had interacted with the centralized political authorities of the Ottoman empire in the past. Had they involved with the Ottoman administrations or had they been outsides? The second was the benefits that they would receive from either side after the fighting. It was really just a constant bidding war to keep the various groups on one side or the other. Finally, the considerations based on the current situation in the area and the balance of forces at any given time were also very important. This reason makes the British constant advancing, even when consolidation may have been more prudent, slightly more understandable. By advancing and appearing strong it made it easier to negotiate with local leaders and increased the number of local leaders that could be influenced by the British. While all of these factors were considered by all sides, the fact was the agreements that were made were very fluid and would often change as soon as the military situation swung back and forth between the two sides. The British knew that this fluidity was just part of the deal and would sometimes use it to their advantage to play tribal leaders off one another to exploit the situation as much as possible. In 1914, just like today, there were a lot of complex issues that were used by both sides to divide, unite, and play groups off one another. Even though the British were doing their best to gain any advantage possible, Toby Dodge, a noted political scientist focusing on the Middle East, has said that the biggest problem that the British fell into was that they had a fundamental misunderstanding of the situation. British leaders incorrectly categorized the regions into a sort of binary system of corrupt town and noble tribes. This sort of generalization was not always correct and caused the British to make some poor decisions and trust the wrong people. Fortunately these decisions would not yet greatly affect the British troops in Kut. And speaking of the troops in Kut, with the troops at a new, more distance, town I am sure you know what I am going to discuss. They were now looking for the next objective that they could strive for, and that new objective became Baghdad, again for the same prestige, show of strength, etc. etc. reasons. Baghdad though was more important than the previous towns captured in the advance. Hardinge, the Viceroy of the Secretary of State for India would have this to say about it "On the other hand from a political point of view, the capture of Baghdad would create immence impression in the MIddle East, especially in Persia, Afghanistan, and on our frontier, and would counteract the unfortunate impression created by the want of success in the Dardanelles. It would also isolate the German parties in Persia, and frustrate the German plans of raising Afghanistan and the tribes, while the impression throughout Arabia would be striking. The effect in India would undoubtedly be good. These are considerations to which I attach great importance." Even with this seemingly very important city in the sights of the troops in Kut it would be 2 months before the start of the advance. Up until now they hadn't encountered too much resistance, but that was about to change. They were constantly advancing further from their supply lines, supply lines that were already stressed as discussed before, and the distances just made things worse. Kut is about 200 miles from Basra as the crow files, and countless more by the winding river. Just to make things even worse, the Ottoman opposition was going to much strong in Baghdad more troops were moving into the area and they were also falling back on their supply lines. In front of Baghdad they would not have any of the supply problems of the British, and they would far outnumber them. After the two month delay the troops of the 6th division, around 11,000 troops, moved on their way towards Baghdad. They would not make it to the city. The Ottoman defenders decided to meet the advance 25 southeast of the city near the town of Ctesiphon. Ctesiphon was the previous Sassanid capital city and was the site of the end of one of the last great Roman offensive campaigns with the legions under the command of Julian winning a Pyhrric victory there in 363. The 11,000 British troops would be met here by around 18,000 Ottoman troops in a battle that lasted for 3 days from November 22nd to 24th. After these days of fighting, and not making very much progress Townshend would have to call for a retreat due to reports of a further 30,000 Ottoman troops on their way to the city to reinforce the defenders. With the decision to retreat made, the question became where to retreat to? Many of the men were wounded, and even those that were unscathed were still exhausted from the march to Ctesiphon and then the fighting. Townshend was forced to stop at Kut, which was already hundreds of miles worth of a march, because his men simply could not go any further and the next viable town to halt the retreat in would be a further hundreds of miles. After the thousands of casualties suffered during the battle a further one thousand would find themselves on the casualty lists during the retreat. Once the troops that were left reached Kut Townshend turned it into an armed camp to await reinforcements and supplies to arrive from Basra. Upon his arrival he communicated to Basra that he would soon be surrounded but he had about a months worth of rations for his men. This message gets Townshend a lot of criticism from historians because it just flat out was not correct. In fact, Townshend had enough supplies to last 3 months, all the way until April 1916 instead of January. This was a huge problem, and a huge mistake, because when the British leaders in Basra heard of the timeframe communicated to them by Townshend they immediately began planning to launch a series of operations that were not well planned or prepared for. If they had had know that they had 4 months to lift the siege the operations would have most likely been far better prepared and supplied and they also would not have been launched in the worst time of the year for large operations. The first attempt was made on January 21st but immediately became bogged down by the heavy rain and resulting mud that was present every January in the region. The Ottomans would not just wait around Kut for the relief forces to arrive but instead left just enough troops to keep Townshend bottled up and moved the rest downriver to meet the advance. The first attempt in January ended in disaster, and another was launched on March 8th, this was stopped in much the same way through a combination of enemy action, lack of resources, and weather conditions. In the first week of April a third attempt was launched, this time by the newly arrived 13th British division which had been diverted from Gallipoli in late 1915 which it was decided to abandon the penninsula. The shortage of rivercraft was so problematic by this point that the troops had to walk all the way from Basra before the attack could be made, and this resulted in another complete failure. 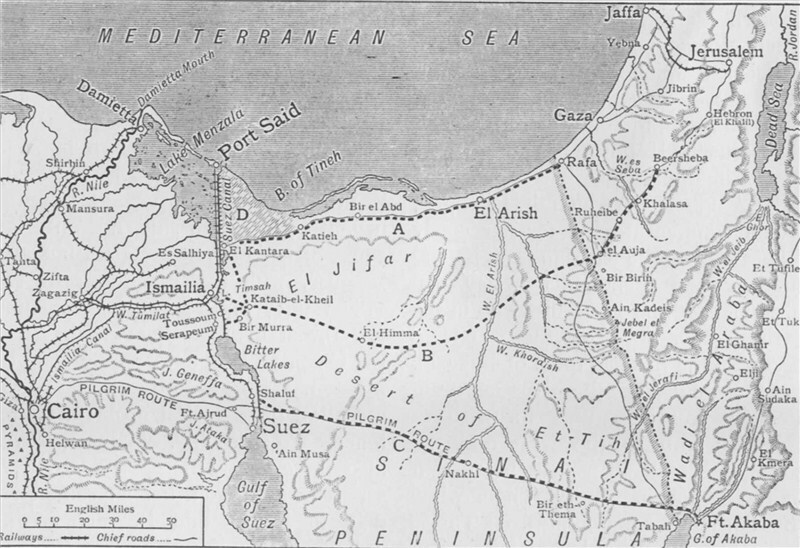 One final attempt to relieve Kut was made on April 25th, but by this point the relief forces had reached, in their own commander's words, the absolute limit of their offensive capability. They had suffered 10,000 casualties, which was a 1/4 of the forces that had been committed to the campaign. In the end, the advance of April 25th was the last chance for the besieged forces of Kut and on April 29th, after 147 days under siege, Townsend, after orders the British and Indian troops to destroy all of their guns in proper fashion, surrendered all of the forces under his command unconditionally. At the time of the surrender it was considered by many contemporaries as the greatest military humiliation that the British had ever suffered. A special committee would be created to investigate the campaign, called the Mesopotamia Commission of Inquiry, in its findings would be this quote would make it clear that there were many failures that caused the disaster, and that they would be fixed in the future "While no one factor was decisive in compromising the first attempt to capture Baghdad, together they overwhelmed the rudimentary military capabilities of Force D. The cathartic shock of the accumulation of failures trigggered a widespread reorganization of operational, administrative, and logistical responsibility and paved the way for the resumption of the advance after months of soul-searching." As for the men who took part in the doomed venture against Baghdad, 10,000 of Townshend's men had died in the attack on Baghdad and the retreat, 13,000 would be taken captive, and there would be 23,000 casualties during the attempted rescue operations. The continuing story of the troops who were taken captive is one of the saddest of the war. Almost 2/3rd of the men would die in captivity during the war, mostly due to a series of marches forced upon them by their captives and the oppressive conditions in the work gangs that they would eventually find themselves in. Townshend on the other hand would live a life of relative luxury near Constantinople for the rest of the war, something that would greatly tarnish his reputation after the war after the horrible fates of his men came to the known. With the fall of Kut, our tour of the Middle East is over for now. 1916 would prove to be the beginning of big things in the Middle East as the long prepared for Arab Revolt begins, the British would attack out of Egypt and into Palestine and one of the most recognizable figures of the war makes his appearance when T.E. Lawrence, better known as Lawrence of Arabia, begins his rise to fame. 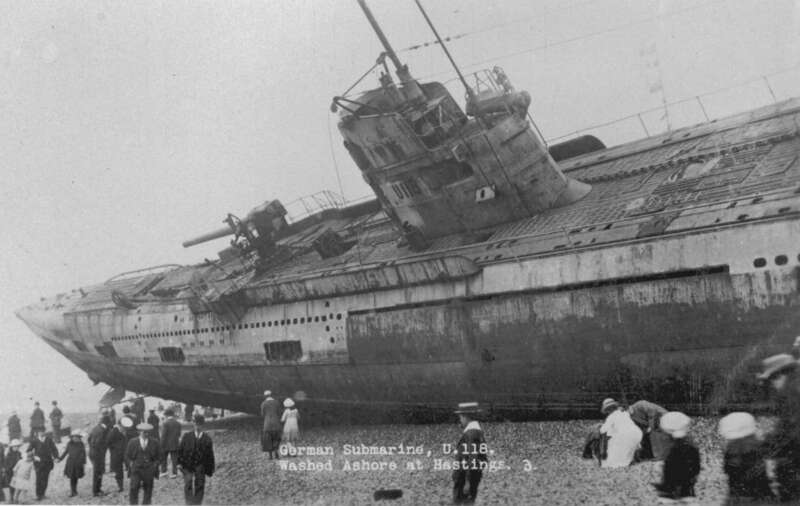 Thank you for listening, and hopefully you will tune in to the next episode as we move our focus out of the Middle Eastern deserts and once again onto the high seas as we take a two episode deep dive into the events that led to the declaration of unrestricted submarine warfare in the spring of 1915.